Accused of sorcery, a 20-year-old mother of two was burnt alive by a group of allegedly drunk and doped-up men while hundreds of people, including schoolchildren, idly watched and took photos on mobile phones. Police were too scared to intervene. ­Kepari Leniata was murdered in Mount Hagen, in the Western Highlands province of Papua New Guinea. Relatives of a six-year-old boy who died in Mount Hagen General Hospital on Tuesday claimed his death was inflicted by sorcery. They interrogated three women, one of whom was Leniata, native to Enga province. The attackers forced Leniata to admit her guilt by torturing her with a red-hot iron rod, local newspaper Post Courier reported. Once they got the ‘confession’ needed, they stripped her naked, bound her hands and feet, doused her with gasoline and set fire to her on a pile of rubbish and old tires. Hundreds of onlookers, including schoolchildren, watched the torture and brutal murder, taking photos of the woman being consumed alive by the fire, with none of them coming to the defense of the victim. Several police officers who happened to be near the scene refrained from stopping the auto-da-fe merely because they were ‘outnumbered’ by the executioners. Once medics and police dared to show up at the scene of the lynching, they couldn’t do anything to save Kepari Leniata’s life. Kaiglo Ambane, police commander superintendent of the Western Highlands province, condemned the crime and promised to investigate it as murder and bring the culprits to justice. 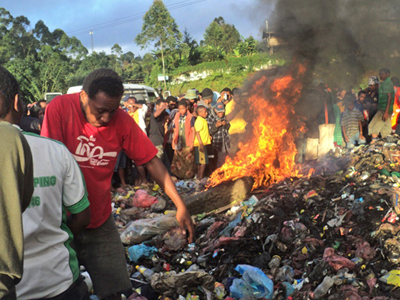 Local authorities acknowledge that burning women for witchcraft is not an uncommon crime in PNG, but it usually doesn’t take place in broad daylight. “It's an ongoing problem and has been in the spotlight for some time now,” PNG police spokesman Dominic Kakas told Australian Associated Press. People in rural areas of Papua New Guinea strongly believe in white and black magic. The spokesman said that witch-hunting is “part of PNG culture” for which people die because courts prefer not to rule in sorcery claims, despite a sorcery act adopted in the country in 1975. Rashida Manjoo, the UN's special rapporteur on violence against women, reported last year that ‘culture sensitive’ extreme violence is only a smokescreen to raid women’s property, using misfortune or death as a pretext. 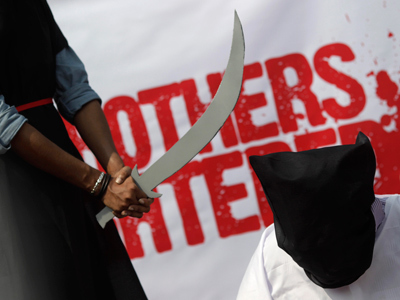 "I was informed that sorcery-related violence is commonly perpetrated by young men or boys who act under orders for other members in the community," Manjoo told the BBC in March 2012. "They commonly do so under the influence of drugs or alcohol, which is provided by such persons,” he said. Manjoo maintained that about two-thirds of females in relationships in PNG are familiar with domestic violence, The Australian newspaper reported.